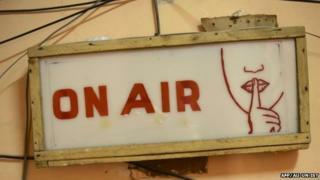 The manager of the independent Shabelle radio station in the Somali capital has told the BBC he is in hiding after the authorities took it off air. Mohamed Musa said soldiers stormed the radio's office on Friday, arresting about 20 people, three of whom are still in custody without being charged. When the station started broadcasting again on Tuesday, the office was raided again and all equipment removed. Mr Musa denied accusations that the station was spreading hate messages. The UN-backed government issued a statement saying that the station had been unprofessional by spreading disharmony amongst Mogadishu's clans. There has been tension in the capital following the government's recent disarmament programme, which has seen the militias of clan leaders disarmed. Mr Musa said Shabelle had not broadcast either for or against the disarmament. "We are not on the side of government, we are not on the side of opposition, we only tell the people the truth," he told the BBC's Focus on Africa radio programme. The BBC's Mohammed Moalimu in Mogadishu says media organisations have condemned the arrests and been shocked at the heavy handed approach of the government. There have been calls for the detainees to be charged in accordance with the constitution, which only allows for 24 hours detention without charge. Mr Musa admitted Shabelle had a fractious relationship with the government, which evicted it from a state-owned building last year. He said he believed there was a warrant out for his arrest and he was concerned for the safety of his colleagues who remained in detention, fearing they were being maltreated. "I'm in hiding in Mogadishu.... I keep moving, it's really very scary." Clan-based warlords, rival politicians and Islamist militants have battled for control of Somalia since the fall of long-serving ruler Siad Barre in 1991. Under a UN-backed plan, a new government was formed in 2012 which is trying to win back territory occupied by the al-Qaeda-affiliated al-Shabab insurgents, and bring back a measure of stability to the country with the help of an African Union force.